Figure 1. 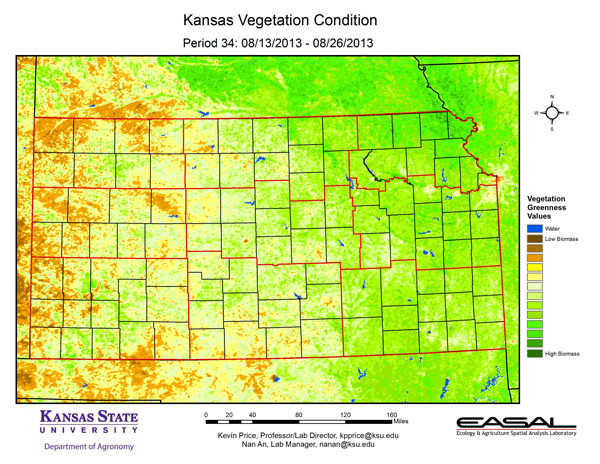 The Vegetation Condition Report for Kansas for August 13 – 26 from K-State’s Ecology and Agriculture Spatial Analysis Laboratory shows that the lowest biomass productivity is in the western third of the state. 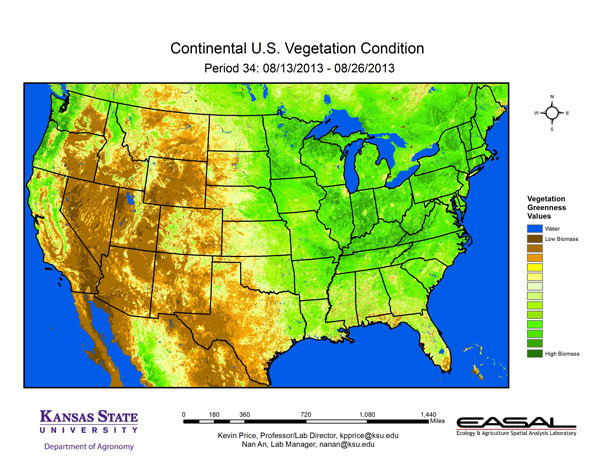 Northwest Kansas is particularly low in photosynthetic activity. Rainfall in that division is only 58% of normal for August and 56% of normal for the year-to-date. Figure 2. 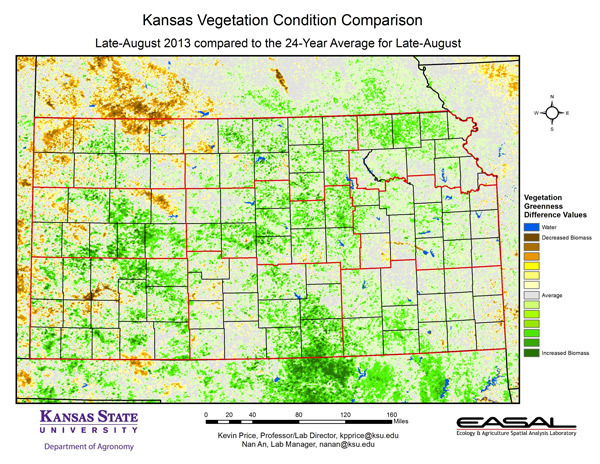 Compared to the previous year at this time for Kansas, the current Vegetation Condition Report for August 13 – 26 from K-State’s Ecology and Agriculture Spatial Analysis Laboratory shows that productivity is much higher statewide. The biggest increase is along the Flint Hills in eastern Kansas. Note that while conditions are much better than last year, much of this is due to the extremely poor conditions that prevailed in 2012. Figure 3. 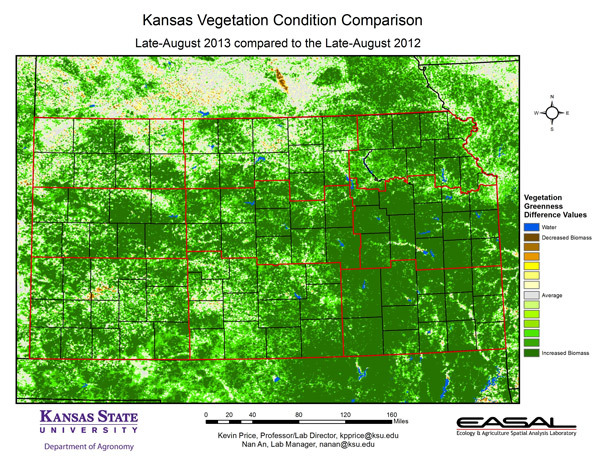 Compared to the 24-year average at this time for Kansas, this year’s Vegetation Condition Report for August 13 – 26 from K-State’s Ecology and Agriculture Spatial Analysis Laboratory shows that areas of slightly greater-than-average biomass production are greatest in the central portions of the state. Sumner County has the largest area of above-normal productivity. The county average precipitation in August was 6.89 inches, or 3.32 inches above average. Figure 4. 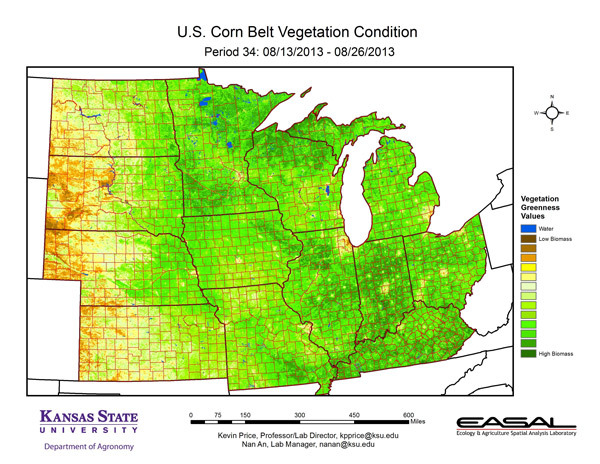 The Vegetation Condition Report for the Corn Belt for August 13 – 26 from K-State’s Ecology and Agriculture Spatial Analysis Laboratory shows that pockets of relatively low photosynthetic activity are beginning to develop in the eastern portions of the region. Northern Missouri is particularly notable. Areas of highest productivity are most prominent in Indiana and Kentucky. The western areas of the region continue to be in extreme to exceptional drought, and continue to have the lowest productivity values in the region. Figure 5. 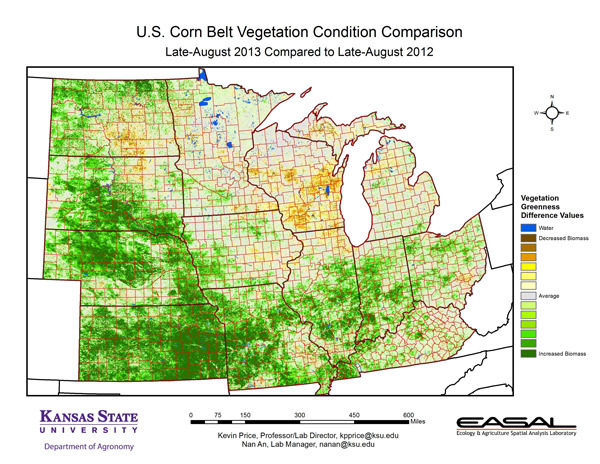 The comparison to last year in the Corn Belt for the period August 13 – 26 from K-State’s Ecology and Agriculture Spatial Analysis Laboratory shows that Kansas has the greatest increase in productivity compared to last year. Wisconsin has the greatest decrease in productivity. In Kansas, 40 percent of the corn and 60 percent of the sorghum was reported in good to excellent condition. Figure 6. 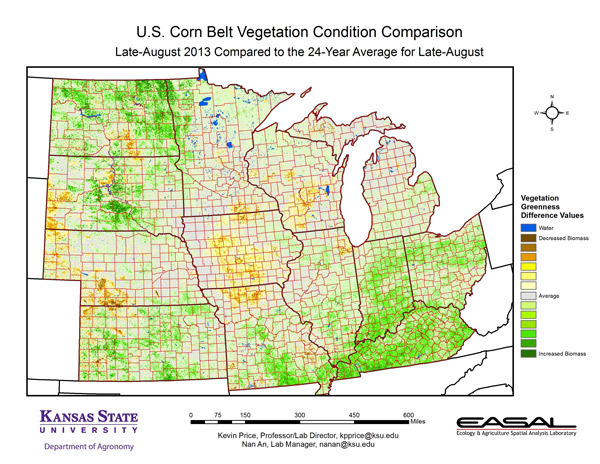 Compared to the 24-year average at this time for the Corn Belt, this year’s Vegetation Condition Report for August 13 – 26 from K-State’s Ecology and Agriculture Spatial Analysis Laboratory shows that northern Missouri and central Iowa have large areas of below-average photosynthetic activity. Drought conditions in these areas have worsened in the last two weeks, as warmer weather increased the impact of lower-than-average precipitation. Figure 7. 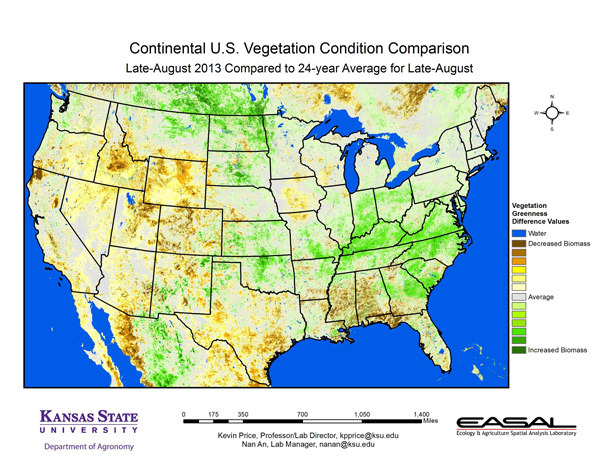 The Vegetation Condition Report for the U.S. for August 13 – 26 from K-State’s Ecology and Agriculture Spatial Analysis Laboratory shows that the highest biomass productivity continues to be in the Ohio River Valley through New England. Additional areas of high productivity can be seen in the Pacific Northwest. Figure 8. 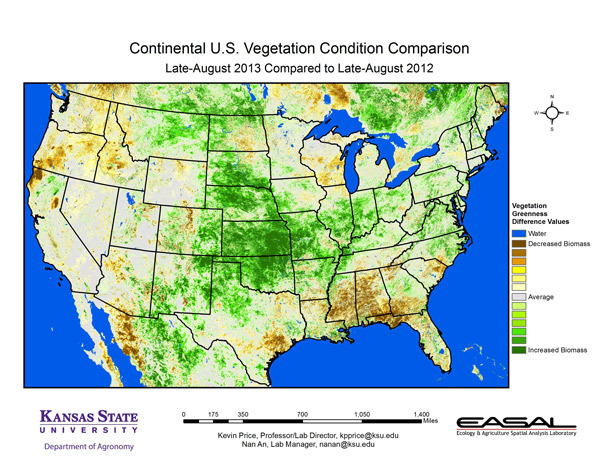 The U.S. comparison to last year at this time for the period August 13 – 26 from K-State’s Ecology and Agriculture Spatial Analysis Laboratory shows that the Central U.S. has the greatest increase in photosynthetic activity. Milder temperatures have allowed for more production even in areas with limited rainfall. Even areas of extreme drought have seen more moisture this year than last. For example, Tribune in western Kansas received 5.32 inches of rain in August. Last year, Tribune had only 5.03 inches for the entire growing season of April-September. Figure 9. The U.S. comparison to the 24-year average for the period August 13 – 26 from K-State’s Ecology and Agriculture Spatial Analysis Laboratory shows much of the Ohio River Valley continues to have above-average biomass production. Parts of the Southeast have below-average NDVI values. Alabama crop reports indicate concern for increased insect and disease problems as cool, wet weather has delayed control activities.